I don’t know of any writer who doesn’t receive a rejection or have frustrations from time to time. We all have those experiences. However, instead of focusing on negativity, this year I’m taking a different approach. I see positive results from those efforts, too. 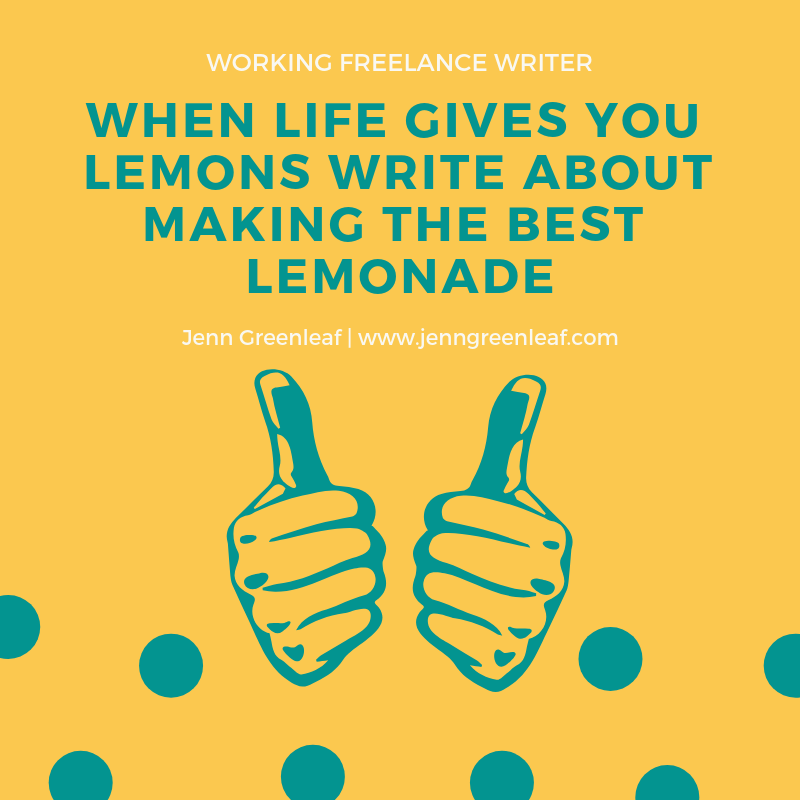 That’s where the title, “When Life Gives You Lemons Write About Making the Best Lemonade” comes from—it’s about taking a different approach and attitude. Where do the best lemons grow? When did lemonade go from fresh squeezed to powder? Do you see where I’m going with this? Turning negativity into something positive in a few seconds is possible. It took me less than a minute to brainstorm ideas from one blog title. If you receive a rejection, look at what went wrong with it, if it’s possible to spin it into a new idea, or how else it can be fleshed out to better support your original thought. Turning negativity into something positive in a few seconds is possible. I lost confidence in my abilities. Before I was a self-starter and, negative thoughts caused me to retreat. I rarely discussed anything about my work with anyone. Networking came to a grinding halt. The main reason I stopped celebrating successes is that I listened to the wrong people. They were struggling with their freelance writing careers. Instead of looking for solutions, they were bringing others down, and I got caught in the crossfires. Now, I’m working toward helping to lift those writers upward and encouraging them to celebrate their successes. Their successes can include anything from completing one item on their to-do list to receiving an acceptance on a pitch. It doesn’t matter as long as you’re celebrating, staying positive, and bringing that positive energy from day to day. You’re Not Bragging: You’re Celebrating! Another reason I stopped celebrating my successes is some writers gave me the impression I was bragging. I took those impressions seriously, and that negativity stuck. It took some diligent work on my part to let those feelings go and move forward with a positive attitude. There are people out there who believe what we’re doing is excellent and want to hear more. That’s the audience we’re focusing on—not the ones who are attempting to keep us quiet. There are people out there who believe what we’re doing is excellent and want to hear more. So, talk often about what you’re doing and how incredible it’s making you feel. If you believe you’re sharing too much—then trim back. For example, your non-disclosure agreements may prevent you from sharing specific information about who you’re writing for or the content. Therefore, you can celebrate those successes by stating you have a new client that’s incredible and you’re excited about moving forward. Networking with other freelance writers is an integral part of operating a successful business. Those who are new to this career should be aware of who they’re adding to their networks. 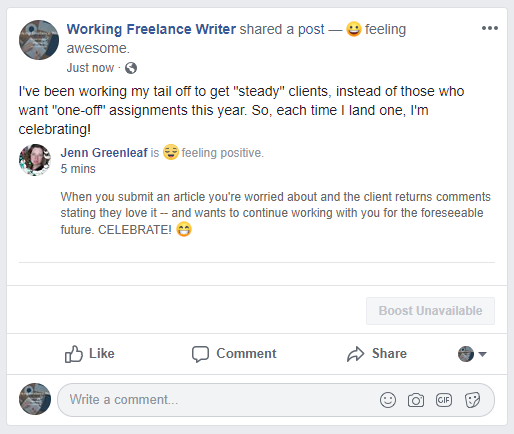 For example, are you adding those who are consistently stating that they can’t find work, there’s no work available anywhere, and they can’t make money freelance writing? If you believe you can help those individuals with contacts, they’re a good addition. Otherwise, be wary because they may bring negativity to your feed. Instead, look for connections that bring value to your network. Are they sharing valuable content? How often do they celebrate their successes? Do they talk about what’s happening in their careers, as well as other interesting topics? For example, is their lemonade sweet or is it sour? You’re in control of how you move forward from here. Celebrating takes courage and, after beginning, you’ll see how many people in your network believe in you.